These Lebanese almond baklawa fingers are delicate, crisp, and fun to make. They’re flavored with aromatic orange blossom syrup. The quantities here of syrup, nuts, and butter are flexible—make more of each if you want to make a bigger batch, and if you have any ingredients leftover, the nuts and butter freeze perfectly for at least a year and the syrup will hold, airtight, in the fridge for months. This recipe makes about 30 3-inch fingers. Make the syrup at least two hours in advance: in a small heavy saucepan, bring the sugar, water, and lemon juice to a boil. Reduce the heat and simmer for about 3 minutes. Remove the pan from the heat and add the orange blossom water. Transfer the syrup to a heatproof container and place it in the refrigerator to chill. Grind the almonds in a grinder or food processor until they resemble coarse crumbs, taking care not to make them too fine. In a small bowl, combine the ground almonds with the sugar. Set up your workstation with the melted clarified butter, pastry brush, and 13x9x2-inch pan. Note that you can use a larger or smaller pan as long as one side is at least 9 inches. Brush the bottom of the pan generously with clarified butter. Open one of the sleeves of phyllo dough and lay the phyllo flat on top of the plastic it’s wrapped in. Cover the phyllo with a very slightly dampened clean kitchen towel immediately, to keep it from drying out. Pull back the towel and carefully pull one sheet of phyllo off the top of the stack and place the short side facing you on the work surface. Recover the phyllo stack with the towel. Brush the phyllo with the clarified butter, first buttering the edges of the phyllo and then the rest of the sheet. Repeat this with another sheet of phyllo. Spoon a narrow line of almonds along the 9-inch/short side of the phyllo in front of you, leaving an inch of space along the 9-inch edge and about ½ inch of space on the side edges. Along the 9-inch edge, carefully lift the phyllo up over the nuts, and roll the nuts up in the phyllo in a tight, compact log. Place the log, seam-side down, into the prepared pan across the 9-inch width. Brush the log generously with clarified butter. Repeat this process, buttering two layers of phyllo and rolling up the nuts into logs, until all of the phyllo in the stack is used. Feel free to open the other package of phyllo and continue making more, but the 13x9x2-inch pan won’t hold all of the logs. In that case, use an additional pan for any overflow. It’s also fine that the logs don’t fill the pan entirely. Using a sharp chef’s knife, cut the logs into 3-inch fingers (make two cuts evenly spaced apart lengthwise across the pan). Bake the baklawa for about 30 minutes, or until the pastry is golden brown and fragrant. Remove it from the oven and immediately pour the cold syrup evenly over the hot pastry, making the all-important sizzling sound that means everything is working out perfectly. Cool the baklawa for at least two hours. Garnish them by spooning a bit of the ground almonds down the center of each row of fingers while they’re still in the pan, and serve. 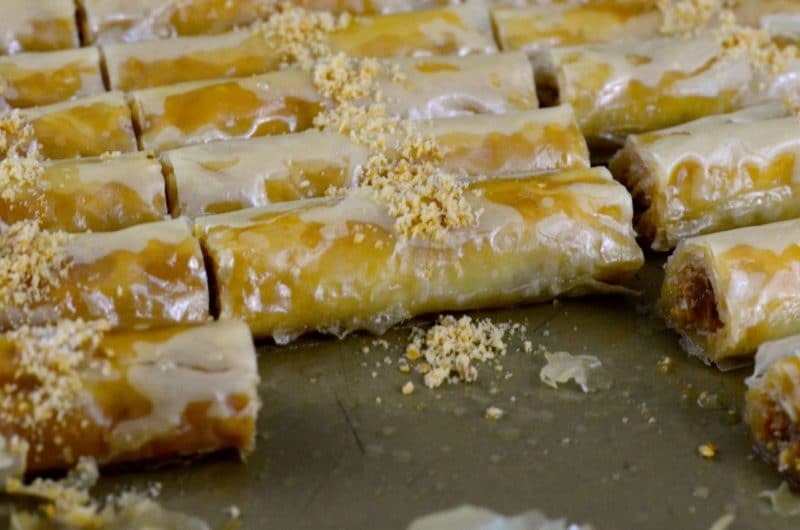 Store the baklawa in the pan until you’re ready to serve them, lightly covered with a sheet of wax paper.